geothermal will play a key role in battling climate change. Recent years haven’t been kind to the geothermal/ground source heat pump industry as government rebates dried up and natural gas prices dipped. However, that is on the verge of changing, delegates heard at the Ontario Geothermal Association Conference Feb. 4-5 in Kitchener, Ont. 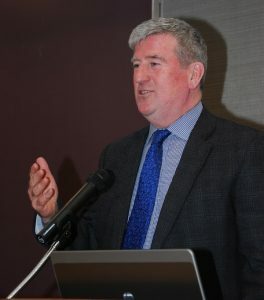 “Geothermal is at the top of the list for non-carbon producing technologies,” said keynote speaker Glen Murray, Ontario minister of the environment and climate change. The government, which spends millions of dollars every year to repair damage from extreme weather like floods, ice storms, etc., sees geothermal, along with solar thermal, as a key part of the solution to rapidly advancing climate change. The maximum climate change the province can endure without significant damage is 1.5C, but if nothing is done the average temperature is expected to increase by 4C within the next 30 years, he told delegates. In addition to extreme weather, an earlier “false” spring has a dramatic effect on crop pollination and germination. Three years ago a warm March followed by a cool April wiped out over 80 percent of Ontario’s apple crop. Ontario produces almost 40 percent of the country’s apples. Ontario Environment Minister Glen Murray believes geothermal will play a key role in battling climate change. Delegates were pleased to hear an environment minister speak who actually knew about geothermal technology and is an active supporter. The government is looking at starting a program to promote geothermal within the next nine months. Earlier that day Murray had announced a $100-million home retrofit program designed to help homeowners update their furnaces, water heaters and insulation in partnership with Enbridge Gas and Union Gas. He suggested a similar program could be made available to the geothermal industry. Another alternative would be to create a “thermal utility” which would provide the underground loops and home and business owners would pay to be connected. “We don’t have time for small ideas,” said Murray. and Brian Pescod, led a discussion on net-zero homes. The next step is up to the industry, said Martin Luymes, director of programs for the Heating, Refrigeration and Air Conditioning Institute of Canada (HRAI). “We need to develop solid ideas and proposals that we can bring forward to the minister.” He added that the OGA, which currently has about 40 members and is working to double that, is better off now that it is working with the Ministry of Environment and Climate Change rather than through the Ministry of Energy. The energy minister’s primary focus has been gas and electric and, to date, geothermal hasn’t really found a fit, added Luymes. He noted that Hydro One (and other electric distribution companies around the country) seem to love air source heat pumps, which increase their share of the energy market, while they see geothermal as something “for rich people. However, he added that the $100 million program announced Feb. 4 was “ill-advised” because the government created it without consulting industry and provided no details or timeline. The industry has grown weary of rebate programs because they can play havoc with the marketplace. Home and building owners tend to put off purchases if they believe a rebate program is coming. The U.S. has long offered a 30 percent tax rebate on geothermal equipment, which has been quite successful. However, along with the cap and trade program the Ontario government plans to implement in 2017, the government’s shift in policy to address climate change will be a tremendous boost to the geothermal industry. These opportunities are over and above the province’s Long-Term Energy Plan, said Luymes. He also noted that while the natural gas industry is rightly worried about the government’s new direction, the utilities might have a role in creating a market for geothermal utilities because their mandate now allows them to invest in technologies that help the environment. 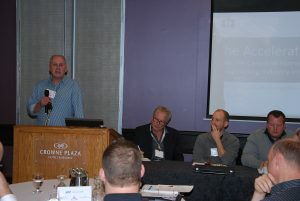 Jim Bolger with panelists, from left, Stan Marco, Derek Satnik and Brian Pescod, led a discussion on net-zero homes. The new opportunities bring a responsibility for the industry to ensure that installations are done properly. It needs to invest in training and system inspections need to become mandatory. Part of the problem is that there is currently no geothermal trade. Installers are supposed to have a refrigeration license, but many don’t, noted Luymes. The OGA and HRAI are currently talking to the College of Trades, which is in charge of trade apprenticeship and licensing in Ontario, about refining current trades to better accommodate geothermal. Many would like to see a geothermal trade established. However, noted Luymes, if solutions are to be found within a reasonable timeframe, it will be best to work within existing regulations, adapting current programs to meet the needs of the sector. Derek Satnik, an advisory board member on the “Net Zero Energy Committee”, with the Canadian Home Builders Association, said that smaller heat pumps will be required to accommodate the smaller heating and cooling loads of “net zero” housing. OGA vice president Jim Bolger (Waterloo Energy Products, Breslau, Ont.) noted that manufacturers already have smaller equipment for smaller homes, down to half ton. Marco added that two to three-ton units are the most efficient, but the industry needs to adopt variable speed pumping to make further gains. In addition to working with the Ministry of Environment, the OGA’s priorities for the coming year are to educate home and building owners about geothermal, define a role for utilities and to explore financing options. OGA president John Bosman (Bostech Mechanical, Listowel, Ont.) urged members to provide input for the OGA’s presentation to the Ontario government. “There is lots of work to do in the next few months,” added Luymes. For more information, visit www.ontariogeothermal.ca.